For years, the 15 passenger van has been a staple for churches, schools, universities and other civic organizations due to its ability to carry a larger group of people all in one vehicle, and the cost effectiveness it provides. However due to the vehicle’s basic flaws, it is continually proven to be one of the most hazardous means of transportation of its kind. In contrast, the 15 passenger bus has proven to be a safer alternative to the dangerous15 passenger van. One of the primary safety advantages of 15 passenger buses is the wider wheel base. Passenger buses have a low center of gravity, whereas 15-passenger vans have a high center of gravity, with each additional passenger raising that center of gravity. Loading 15-passenger vans causes the center of gravity to shift rearward and upward, increasing the probability of a rollover. The National Highway Traffic Safety Administration (NHTS) has issued a safety advisory on these vans due to the fact that they are more likely to be involved in a single-vehicle rollover crash than any other type of vehicle. Another great advantage of a passenger bus is the level of comfort it provides. Passenger vans are outfitted with bench seating which is often uncomfortable on long trips. Passenger buses are equipped with spacious individual seating that can be high-back, reclining and come with level 5 upgraded seat fabrics. There is also added legroom, optional foot rests, optional arm rests, and large luggage bays to safely store your belongings for your convenience. 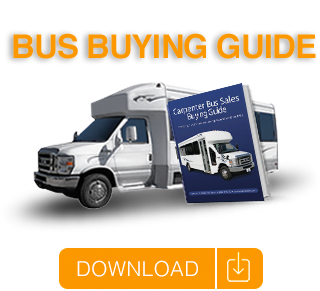 In addition to the safety and comfort advantages, there are plenty of technological advantages to purchasing a 15 passenger bus instead of a 15 passenger vans. With the higher interior height on a passenger bus, you have the ability to have up to a 32” TV/DVD package that makes long trips go by much faster while watching movies. In addition to the A/V packages available, buses now can be outfitted with WiFi™ to keep your passengers connected on their favorite devices. With all the advances in construction, safety, comfort and technology, the 15 passenger van has become the go-to vehicle of choice for replacing the older style 15 passenger vans.